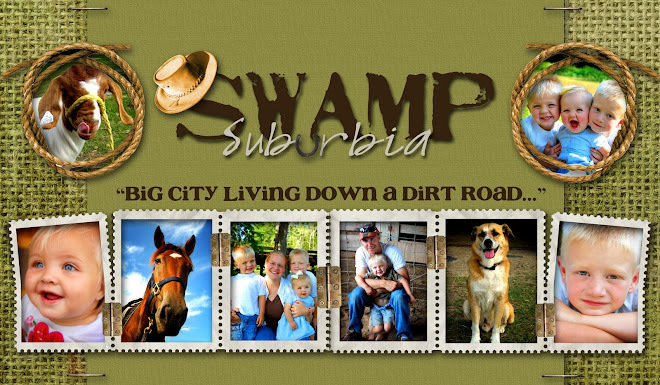 Swamp Suburbia: "I'm a Workin Man"
Ever since Little Cowpoke and I went to visit Mr. 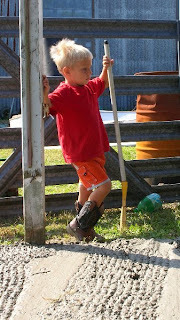 Cowboy at his work site, Little Cowpoke has told everyone, "I'm a workin man!" Little Cowpoke is obsessed with working right now. He wears his hard hat around and finds "jobs" to do all around the house. If Mr. Cowboy only knew I was taking his picture while he was working. I had never seen him with a hard hat on before. Hubba hubba. I think I kinda like my workin man. Okay, I think he caught me. Poor guy, I think I would be so mad if someone always had their camera in my face. He is a good sport about it most of the time. Little Cowpoke thought that his Dad was the absolute coolest. He was so excited about his Dad being a "workin man". 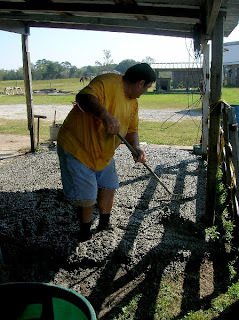 So, when we had some cement poured the other day. Little Cowpoke was so excited to become a hard workin man. 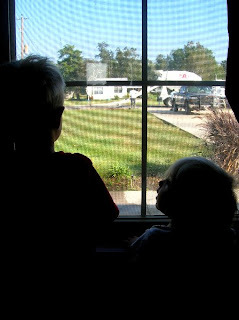 "Look there Sis, those are workin men! I am a workin Man too!" 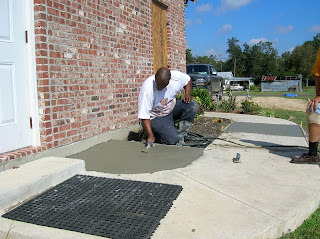 We are pouring cement at the end of our driveway for our mail box. Mr. Cowboy has this fantastic idea for a stone mail box. I do have to remind him we do live in the country. We also had part of our side walk broken out. It has cracked and sunk, so we had that fixed too. Then we had a place poured for our trash can to sit. I am so excited that our trash can is now on the side of our house and not in the front. 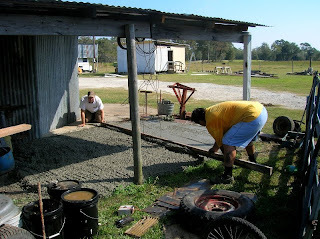 After we got all of our stuff poured, there was some extra cement. 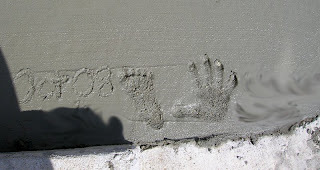 So, we went over to the in laws (right next door) and poured him some cement too. Move over treasures, here comes the cement. My Father in Law just jumps right in there. He was impressed that his leg didn't come off. I was impressed that he was up past his ankles in cement. Then Mr. 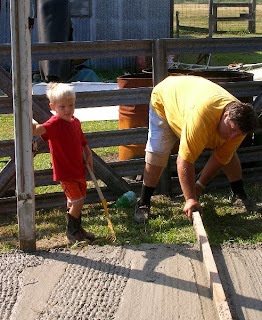 Cowboy came over to help flatten it all out. They did a pretty good job. They even had to move more treasures. 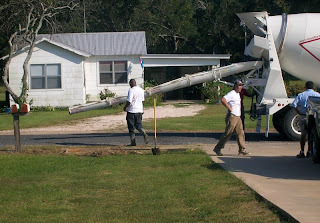 My Father in Law was so excited to get that much cement. 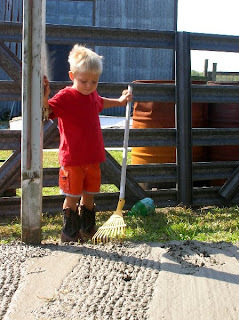 Little Cowpoke was more than excited to help out, with him being a "working man" and all. 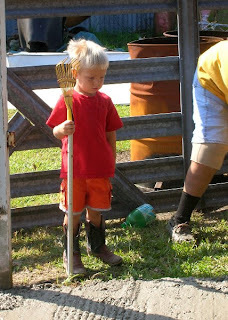 He put on his boots and got his rake and went over to help out. You can just see those gears going inside that blond little head. And there you have it. Mr. Working Man himself. Getting in there and helping. Few, that was some hard work, it must be time for a break. Good work Little Cowpoke. You are such a hard workin man. Cowpokette even got her feet dirty. She kept wanting to crinkle her toes and feel the cement. 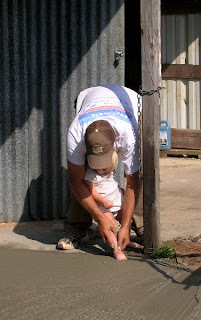 She was hard to get to put a flat foot print in the cement. 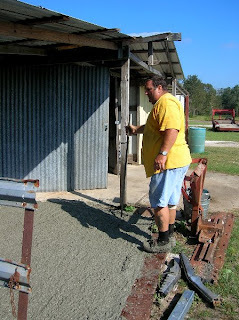 But mean while, back at our house, the cement was getting finished. This man was huge. He was taller than 6 feet. And he had the deepest voice. His voice reminded me of the really tall man off of the movie, "The Green Mile." I can't remember that guy's name. 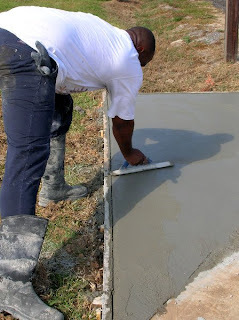 Anyway, while he was finishing the cement, he was telling us about his four kids. He was funny. I liked to hear him talk. He kept saying, "Your daughter is so beautiful. Look at that blond hair and those blue eyes." I wanted to say, "Back away from the baby!" But I knew he was just being nice. 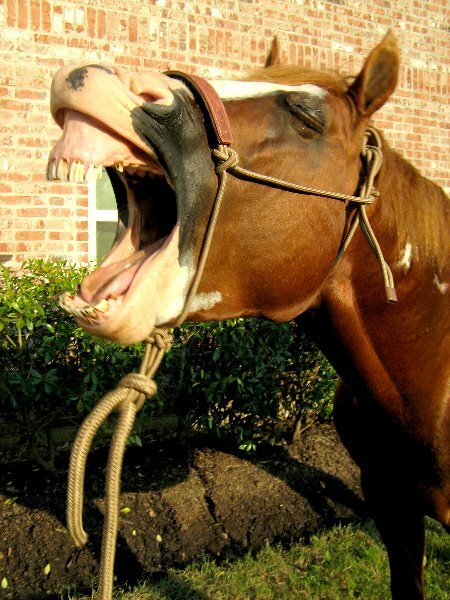 Cowpokette thought he was funny too. He was a really good finisher. I decided that I would not be a good finisher. I would have gotten fed up with it looking perfect. But our tall friend there did a wonderful job, and the kids and dog got to put a foot or hand print in. I am so grateful for my hard workin men. Don't forget about the giveaway. Today is the last day!! Kids are so cute...especially when they mimic their parents (in a good way!) How fun! Mr. 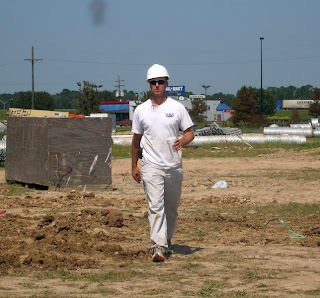 Cowboy looks pretty good in hard hat and shades. 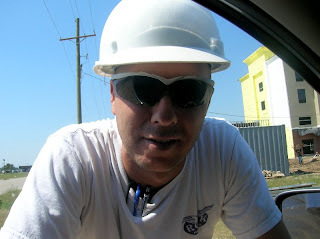 My second husband worked for the cable company for a while and looked pretty hot in his boots and gafs. Way back in the day. The kids are as cute as ever ! 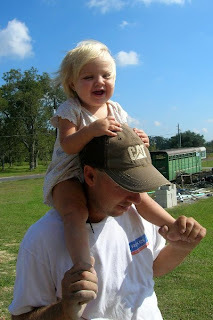 And I could see why the tall guy would keep commenting on how cute little cowpokette is...she is a doll!! AWW how sweet! Little cowpoke is a cutie there! 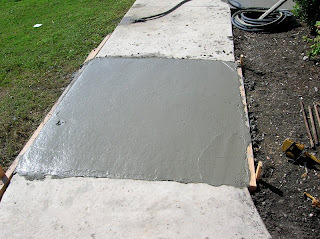 Congrats on the cement, that's one thing we don't have here! How adorable ... those little foot prints in the cement! Little Cowpoke and Ms Cowpokette ... how cute! Yep, Mr. 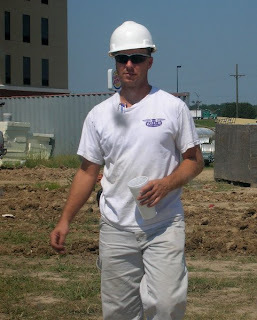 Cowboy looks "cool" in the hardhat! You're right--I could imagine your son's gears working. Too cute! Love the boots and shorts! That Picture of little Cowpokette is precious! Handsome fellayou have there! I think they must just ignore us, by now! I think they secretly like being the center of our blog world! he he! Orange You Glad it's Halloween? High Ho Silver, or Sorrel! 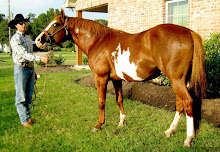 Time's Up, Sale Barn, and Another Contest! !